Browse an alphabetical list of subjects in Acumen, UA Libraries' digital archives. Read about how we digitize all the cool stuff in Acumen! Get technical with us and find out about our policies, procedures, workflows, and more! 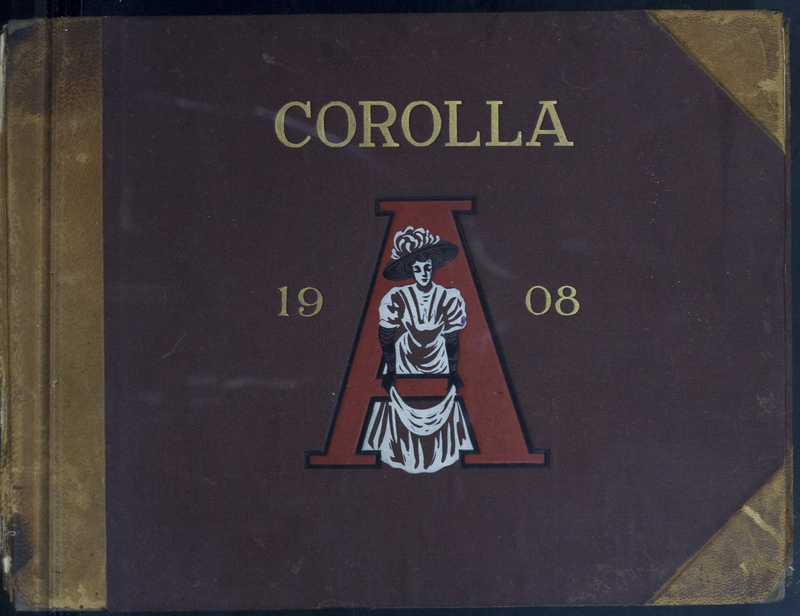 The yearbook for the University of Alabama, begun in 1893. An audio collection of 73 of interviews recorded in the early 1980s, with elderly Alabamians (mostly African-American) sharing their thoughts and memories on a variety of subjects. How do I browse subjects in the digital archives? Browse the University of Alabama's digitized archives and special collections materials by subject. Subjects are alphabetized and arranged by letter in separate tabbed pages (above). It's easy to explore and find what interests you: click on any subject and a new browser window will display a list of items in Acumen. The University of Alabama Libraries' digital archives explorer. Access current student research, digitized historical material, finding aids from the W.S. Hoole Special Collections Library, and more. Browse the UA digital archives by category. How do I find items in the digital archives? Acumen is UA Libraries' homegrown digital content repository. You can search there for digital archives directly. Acumen is keyword anywhere search. Use the dropdown beside the search box to limit your search to a particular format, like photos or audio. For more information on how to get the most from the University of Alabama's digitized collections. Scout is UA Libraries' discovery interface. 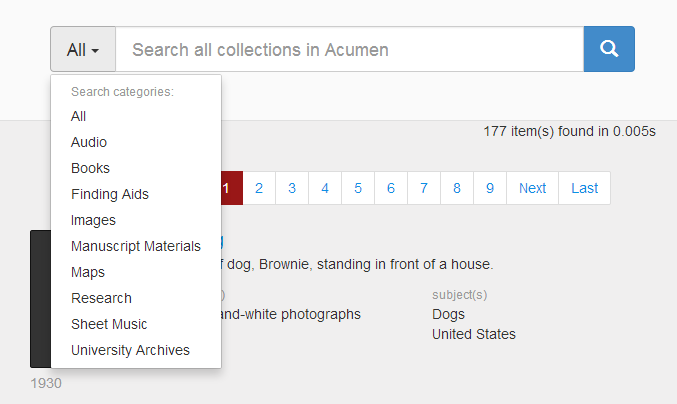 A search of Scout automatically includes a search of the digital collections. To search just for digital archives material, go to the Advanced Search page (linked below the search box) and check the box labeled "Digital Collections Only." 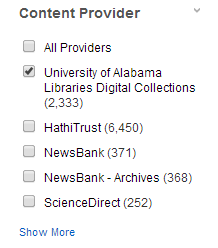 Or if you're already on the search results page, look at the limiter "Content Provider" (panel at the bottom of the lefthand sidebar) and choose "University of Alabama Libraries Digital Collections." Can't find the subject you're looking for? Ask Google to find different words for what you are searching. What's in the digital archives? The digital repository also contains all the Dissertations & Theses written by UA students since 2008, about 2200 total. During his many travels throughout the United States and Canada, botanist Roland Harper collected railroad timetables as souvenirs of his trips. 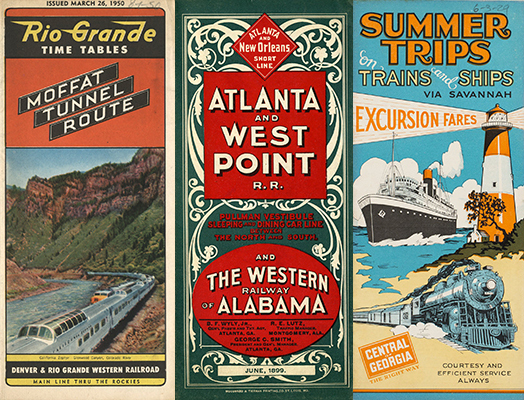 The railroad timetables date from 1887 to 1962 and many provide maps of the locations.